Incredible 40 Billion CFUs per stick pack. Pro-Biotics Plus® Stick packs an advanced, high quality probiotic. New stick packs offer 40 Billion CFU’s in just one sleeve. Pro-Biotics Plus® Stick Packs in convenient box of 30 Stick Packs. We heard you. We are putting our famous chewables in stick packs. With 12 strains of friendly bacteria this highly active formula has years of technology behind it. From the Author of "The Wonder of Probiotics"
Same flavor and ingredients, now with 40 billion CFU’s per stick pack! No more chewables. Why? The stick packs are easier to take. Travels better. To go packs are easy to take with you when you are on the go. The same great flavor it always had now in powder form. Put it in your favorite smoothie, juice, water, yogurt or just open and eat right from the package. Your kids will love this new way of getting their daily probiotics. Our 12 probiotic strains in Pro-Biotics Plus® To Go Stick Packs with Prebiotics and Zinc to help support digestion, maintain a healthy gut and GI tract for digestive balance daily. Pro-Biotics Plus® To Go Stick Packs contains the highest quality, live stable probiotics formulated to target your body's unique needs; the perfect way to support an optimal digestive balance. Pro-Biotics Plus® To Go stick Pack is formulated to survive the harsh conditions in the GI Tract to support the colonization of flora in the gut with no refrigeration needed. Pro-Biotics Plus® 12 can help in restoring the balance of intestinal micro flora that is so important to a healthy immune system and overall good health. You need 2-3 pounds of beneficial bacteria in your gut to protect against disease and illness! Without good bacteria, our bodies are unable to digest food properly and our intestines become overrun with toxins and waste, which restrict the absorption of nutrients and set the breeding ground for disease. Unfortunately every time we drink chlorinated water, coffee and alcohol, eat fatty foods, get stressed or become overly tired, we unknowingly kill the good bacteria in our bodies. Even the foods we eat to keep healthy, like meat and milk contain antibiotics, further reduce the levels of good bacteria. For most Americans this means that everyday we negatively impact our bodies' ability to stay healthy. Pro-Biotics are linked to long life... For centuries natives of the Balkan islands have enjoyed extraordinary long and healthy lives. It was eventually determined that their good fortune was, in part, due to the fact that they ingest large quantities of lactobacilli (good bacteria). Pro-Biotics Plus ® is a collective effort to maximize our natural immune defenses! Live Enzyme Activated Delivery System ® (L.E.A.D.S. ®) insures assimilation at a cellular level. This particular combination of enzyme and mineral cofactors helps to activate each individual ingrediant for maximum particle digestion and complete nutrient distribution throughout the body. It increases the formula's bioavailability. Nature Always Provides A Solution! Pro-Biotics Plus® combines some of nature's most effective immune strengtheners into one easy to consume powder. It rivals other products by combining the strongest immune enhancing properties found in nature into one complete formula that is further enhanced by our unique cellular absorption system for maximum protection. With this combination of vitamins, minerals, probiotics and other healthy nutrients you can super charge your immune system while improving intestinal health. Pro-Biotics Plus® Stick Packs are safe and contain only the highest quality ingredients with the strictest manufacturing standards to ensure purity and efficacy. It is safe, all natural. This is a formula you can trust. You'll begin to strengthen your immune system immediately. If you would like a signed book "THE WONDER OF PROBIOTICS" order from this web site and you will get a personally signed copy. You need 2-3 pounds of beneficial bacteria in your gut to protect and support your immune system! ProBiotics are linked to long life... For centuries natives of the Balkan islands have enjoyed extraordinary long and healthy lives. It was eventually determined that their good fortune was, in part, due to the fact that they ingest large quantities of lactobacilli (good bacteria). Our tabs do not contain any, chemicals, gluten, eggs, preservatives, corn, artificial coloring or flavoring. All Natural Ingredients are guaranteed Non-GMO. Our facility that manufactures all of our formulas is certified and is in full compliance with GMP Requirements for Dietary Supplements. We also utilize a third party testing lab that insures that all our quality ingredients are tested and retested for purity and quality. All NWC Naturals® products are Made and bottled in a USA facility. * The statements made within this website have not been evaluated by the Food and Drug Administration. These statements and the products of this company are not intended to diagnose, treat, cure, or prevent any disease. All Pro-Biotics will benefit from proper storage to insure a long shelf life with full potency. Nothing in these formulas actually goes stale or bad with time. The potency will go down depending on how it is stored. If stored at room temperature we guarantee full potency through the date printed on the bottle. Since we only use fully stabilized versions of the probiotics and we formulate with more than double what we claim on the label, we can guarantee the potency that is listed on the label if left out at room temperature. When Pro-Biotics Plus® is stored in the refrigerator you can add 6 months to the life of the product. When you store Pro-Biotics Plus® in the freezer you can add one full year to the life of the product. Always keep the lid tightly closed. When you receive your product check the date and decide if you will be using the product up by that date. If not, then either refrigerate or freeze the product accordingly. Infectious diseases continue to claim lives - Pro-Biotics Plus Offers an Immune boosting solution to help you stay healthy. Infectious diseases are the leading cause of death worldwide and the third largest cause of death among Americans. Each year, more than 13 million people die from infectious diseases. Despite the large number of antibiotics available, sickness and disease continue to spread throughout the world as more and more antibiotic-resistant strains of bacteria and viruses continue to develop. In the United States, these super germs have come about as a result of our overuse of antibiotics. According to the Center for Disease Control and Prevention, one-third of the 150 million antibiotic prescriptions written each year are unnecessary. As more and more people continue to overuse antibiotics, bacteria strains have now become stronger than the medicine once used to combat them. The World Health Organization stated in its World Health Report 1996, that "too few new drugs are being developed to replace those that have lost their effectiveness. In the race for supremacy, microbes are sprinting ahead." Fact: The body's immune system is the key to preventing colds and flu, and living a healthier, longer life. Lets face it, when your immune system is strong you get sick less often and recover more quickly. Why do some probiotics need to be refrigerated and not others? Probiotics are live cultures and are generally unstable at temperatures over 75 degrees. HOWEVER, the temperature inside the body is well over 75 degrees, not to mention that the probiotics would have to pass through hostile stomach acid and bile to get to the intestine. So what is the answer? The answer is to buy a probiotic supplement that contains stabilized strains of bacteria. The fact is, a probiotic that requires refrigeration is a red flag that it is not stable and will die on impact within the body. Make sure you read the label of any probiotics to be sure that the probiotics are stabilized. 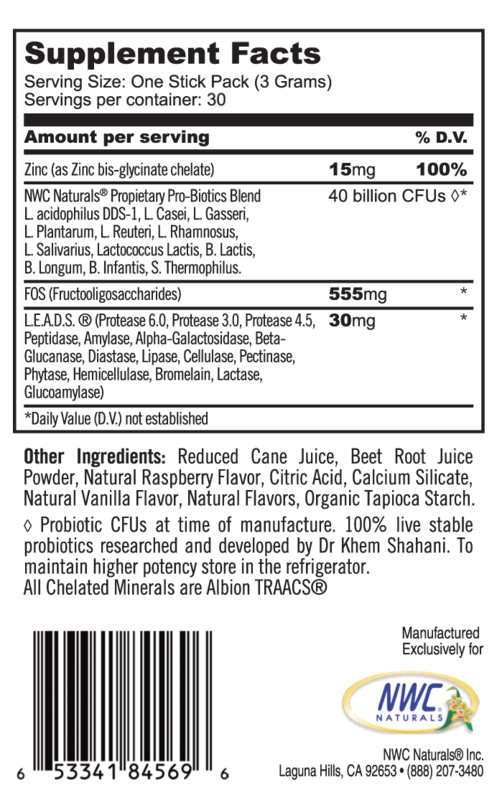 Also be sure that your probiotic contains prebiotics such as FOS. this is food for the good guy bacteria and helps insure colonization. Ours do not need to be refrigerated. Make a wise choice and check the labels. Not all probiotics are alike. Many cheap probiotics are unstable and lose their beneficial properties in the stomach before the probiotics can reach the intestine. The intestine is where the probiotics need to implant in order to seed your intestinal tract with healthy flora. Don't take any probiotic if you can not find out what strain of bacteria are in them. Many manufacturers of both yogurt and supplements claim that this information is "commercially sensitive". Why should consumers buy and take something if they don't know if it contains the particular strain or the CFU's they want ? Lactobacillus Acidophilus DDS 1 strain - researched and developed by Dr. Khem Shahani over 77 years ago, has been, and still is, the most effective probiotic strain. Acidophilus defends against the greatest number of pathogens, inhibiting the growth of bad bacteria. Called the “sticker strain,” Acidophilus has the ability to actually cling to the intestinal wall without harming it. In fact, it is best known for its ability to move undisrupted through the stomach and into the intestines where it eats away at harmful bacteria. It is known for reducing the occurrence of occasional constipation and diarrhea, increasing nutrient uptake (especially calcium) and supporting healthy skin conditions. B. lactis -Both old names B. animalis and B. lactis are still used on product labels, as this species is frequently used as a probiotic. B. infantis - Normalizes inflammation in the gastrointestinal tract and can crowd out some strains of E. coli. According to the Journal of Applied Bacteriology, B. infantis is part of an important group of microorganisms, which are considered to exert a range of biological activities related to human health. This particular strain of probiotic has also been shown to produce compounds useful toward supporting intestinal health. B. longum - Aids in the cleansing and health of the colon and liver. It is also known for supporting normal breast health. L. gasseri - A number of clinical studies suggest that Lactobacillus gasseri may help reduce abdominal fat and support weight loss. Also known as the weight loss support probiotic. L. casei - Is reported to be one of the most potent defenders from Listeria bacteria. It is also known for its ability to induce an immune response that is helpful in supporting a healthy urinary tract. L. plantarum - Can be found in naturally fermented foods. In your body it is found in the large intestine where it helps to break down protein into usable nutrients, thus normalizing inflammation. L. rhamnosus - Is one of the more highly studied probiotic strains, primarily used in support of normal gastrointestinal health. It also aids the body in balancing the normal flora ecology and supports a healthy urinary tract. L. salivarius - Has been shown through research to produce a high amount of lactic acid, which can inhibit the growth of H. pylori bacteria. L. Lactis - Helpful with digestive issues and inflammation of any part of the digestive tract. S. thermophilus - Is known for repairing free radical damage from aging, stress, antibiotics, chlorinated water and other chemicals. It also contains an antioxidant that helps normalize inflammation and protect against the toxins present in the Standard American Diet. Zinc- serves many functions, including acting as a constituent to at least 25 enzymes involved in digestion and metabolism. Research indicates that the health of the body’s natural killer cells may be dependent on zinc intake for normal growth and development. Zinc is very important for proper function of the thymus gland and thymus hormones, as well as cellular immunity. Prebiotics - Inulin FOS (Fructooligosaccharides) – is one of the best-known prebiotics. FOS is a class of simple carbohydrates found naturally in certain plants, such as Jerusalem artichokes, onions and bananas. It is known to promote the growth of beneficial bacteria in the gastrointestinal tract and has been shown to stimulate growth of Bifidobacterium in the colon, facilitating good colonization. Supplementing with FOS can greatly increase metabolic activity in the colon and help relieve constipation and reduce the production of intestinal putrefactive substances. Healthy colon function is vital to a properly functioning immune system. Other: Reduced Cane Juice, Beet Root juice powder, Natural fruit flavors, Citric Acid, Silicon Dixide, Magnesium stearate, Stearic acid. This product is Gluten free,soy free, Non-GMO, Corn Free, Chemical Free, No Artificial Colors or Preservatives. All Natural Ingredients and in full compliance with GMP Requirements for Dietary Supplements. Open a stick pack sleeve, pour all or half on your tongue and enjoy! Or add it to a smoothie or fruit juice. Also great in Yogurt. Consume one or half a day. For smaller children ¼ to ½ a stick day. Probiotics implant much better when they travel with food. It gives them more opportunity to jump off the train, so to speak, and set up camp. Also, all the other nutrients will absorb better when they go through the intestinal tract slower. For extended freshness you can refrigerate. For people who drink carbonated beverages, chlorinated water, coffee and alcohol, eat fatty foods, get stressed or become overly tired, we unknowingly kill the good bacteria in our bodies. Even the foods we eat to keep healthy, like meat, poultry and milk, often contain antibiotics that further reduce the levels of good bacteria. For most Americans, this means every day we negatively influence our bodies' ability to stay healthy. So we need to take probiotics everyday. 1. What type of research is behind the Pro-Biotics Plus ® formula? Pro-Biotics Plus ® combines the latest research and clinical studies on immunity into one powerful formula. Each ingredient has been independently researched by the most respected names in its field. For example, the probiotics in Pro-Biotics Plus ® were selected after consulting with Dr. Khem Shahani from the University of Nebraska. Dr. Shahani is recognized as the world’s foremost authority on beneficial bacteria supplementation and is a pioneer in the discovery of DDS-1 Acidophilus. Pro-Biotics Plus ® is a formula you can trust because its ingredients are clinically tested and proven. 2. I heard that you should not take immune boosters daily. Is this true? This is not true for Pro-Biotics Plus®. Products that contain herbs such as Goldenseal and Echinacea should not be used over long periods of time because they are not supportive of the immune system but rather force it to react, potentially causing an imbalance and over activity. Pro-Biotics Plus ® contains none of these herbs and can safely be taken every day. 3. Can I give Pro-Biotics Plus ® to my children? Yes, this formula is safe for most people. For children less than 8 years of age use half the recommended adult dose. Check with a pediatrician before giving to a child 3 years or younger. 4. Why should I take this formula with a meal? Pro-biotics implant much better when they travel with food. It gives them more opportunity to jump off the train, so to speak, and set up camp. Also, all the other nutrients will absorb better when they go through the intestinal tract slower. 5. What should I look for in a good probiotic supplement? It is good to look for one that is high in CFU's and more than one or two strains. What is a CFU? CFU or Colony Forming Units - A unit of measurement used in microbiology that indicates the number of microorganisms present. Think of them like seeds that you are going to use to plant a garden. It is also a measure of how many bacteria (and yeast, because there are probiotic yeasts) are able to divide and form colonies. It might be easier, to think of colony forming units as being a single bacterium. If the probiotic bacteria are capable of dividing and forming colonies then that is proof that they are alive and healthy. 6. How many cfu's do I need? For general good health, most experts recommend between 6 to 17 billion CFU's each day. Take the dose suggested on the bottle or used in successful medical trials for that health problem. For a major health problem you need to be guided by your personal health professional. Our capsules have 3.6 billion live pro-biotics per capsule of the top five immune support strains per capsules. Our chewables have 10 Billion CFUs per Tablet. 7. Should I take a multi strain or single strain probiotic? A multi strain duplicates the natural process of eating probiotics in your food where you take in a variety of lactic acid bacteria. So for general good health, a multi strain probiotic that has at least both Lactobacillus and Bifidobacterium species is best.